-G. F. HEUBLEIN & BRO. INC., Hartford, Conn.
“Our National Accounting Machines save us $17,000 a year, repaying their cost every 10 months. “Our accounting requirements are unusually complex because we manufacture as well as import many varieties of food and beverages. National Accounting Machines solve our problems with efficiency and economy. Through them we handle our payroll, accounts payable, accounts receivable; and they provide us with detailed sales analyses by products, by salesmen and by territories. Manufacturers of A.1. Sauce, A.1. Worcestershire, Andersen’s Soups and Maltex Cereals. Producers of bottled Cocktails and Smirnoff Vodka. Heublein also imports Bell’s Scotch, Huntley & Palmer Biscuits, Robertson’s Marmalades and other specialties. In your business, too, National machines will pay for themselves with the money they save, then continue savings as annual profit. Your nearby National man will gladly show how much you can save—and why your operators will be happier. A building on Portage Avenue in Winnipeg is covered in signs advertising typewriters and other business products. A large placard proudly boasts that the business within is an official retailer of National Cash Register. The building is completely vacant. The typewriter company closed over ten years ago. So, are they figuring a business would have multiple of these, or did they really cost (10/12ths of 17,000)=$14,166 or so? Although this is a precision instrument, that seems very expensive. I once programmed on an NCR 500 computer, that had one of those as its console. (Machine code was entered on the multi-row “cash register” keyboard.) The large piece of manila stock behind the smaller forms she’s got there had magnetic tape glued to their backs, and the machine would record the typed information on them electronically. 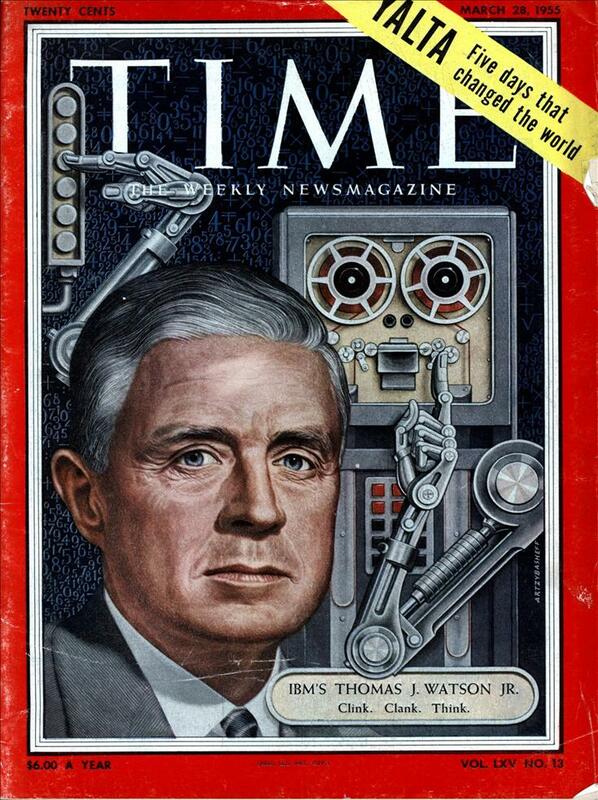 It was pretty cool thinking, in a Rube Goldberg sort of way. I could see that costing $15,000 1955 dollars easily. But who knew Bells, Lee & Perrins, Robertsons, Huntley & Palmer, etc all had the same US distributor? My guess is that these machines cost around $2,500 in 1955, if that. A new Cadillac cost around $4,000 in 1955. Notice that it says their machineS (plural) save them 17 grand a year, so that only sets an upper limit on the cost of the device. So I’m still confused as to what these actually do. Are they a key-punch machine, and adding machine, or something else? And why do they have a typewriter keyboard? Ellis Adding-Typewriter Co. sold typewriter-adding machines from 1911 until 1929, when the company was purchased by the National Cash Register Co. The 1909 Remington machine described above was a typewriter with an adding/subtracting attachment. The Ellis was an adding machine designed to print on ledger cards; it was supplied both with and without the addition of a typewriter keyboard. A merchant could have a ledger card for each customer and use an Ellis machine to update a customer’s credit balance each time a purchase was made or a payment was received. Ellis machines were sold by NCR as National Accounting Machines, National Typewriter Bookkeeping Machines and NCR Accounting Machines from 1930 until at least 1962. 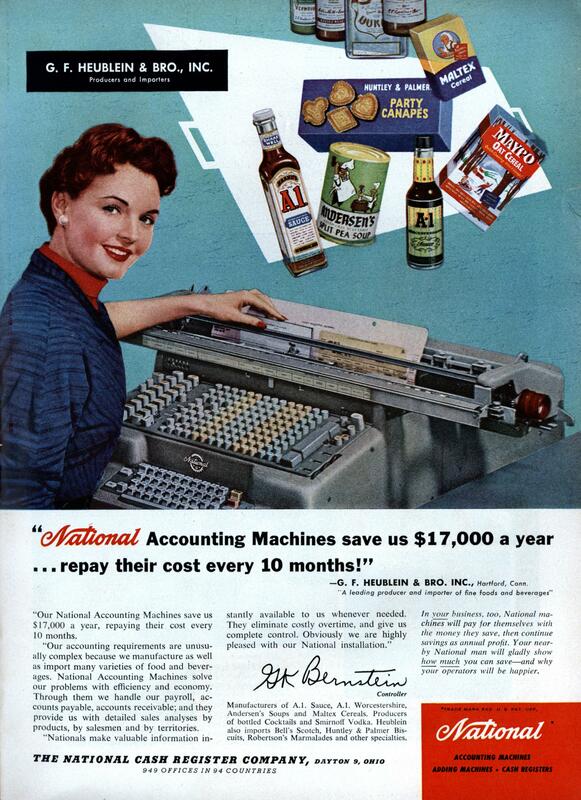 At one time, NCR produced at least 13 different models for various types of accounting and bookkeeping applications. Chroma: I believe the $17,000 refers to the wages they used to pay to several people that the machine[s] replaced. IOW, each machine does the work of several people. As the ad copy states, these machines could do many things, such as payroll, accounting, tracking sales/salesmen, etc. Today all of this can be done by an inexpensive computer that costs far less than this antique. I’d imagine early programming was by plug-board: the one I used had ferrite “ROM” and “RAM” core (1/2 K words of each), but I also programmed IBM card sorters of the same era using plug boards. Of course you also had card input/output and it wasn’t unusual to punch a new deck as an update, or to use 5-bit paper tape (Baudot and BCD.) To make things interesting, NCR and IBM had different implementations of “Hollerith” code so cards weren’t very portable. These were all antiques when I used them, by the way. 15-20 years is a long time in computing.